Compared to most aquarium fish, Goldfish are messy creatures that produce a lot of bodily waste, and if kept in the right conditions will grow large. Because of this many Goldfish publications and websites emphasize the need for as large an aquarium as you can afford, or fit into the space you have available. This is all very well, but with size comes weight, filtration and maintenance issues, so you need to choose an aquarium design that best suits your requirements. If you are using the aquarium for breeding, there is no point having an aquarium 18” (460mm) deep. Goldfish come into the shallows to breed so the water should be no more than 9” (230mm) deep or less, depending on the size of the breeders. If you are using the aquarium for displaying your Goldfish I wouldn’t have an aquarium any less than 15” (380mm) deep, 18” would be better, but bear in mind if the aquarium is deeper than your arm, you will need tools for planting, moving decorations or removing anything from the aquarium. This is particularly relevant for extreme aquarium designs that use acrylic instead of glass for construction. A popular design is a tubular format that can be as deep as the manufacturer wants to make it, but consider how algae growing on the side of the aquarium 3’ (900mm) down will be removed. Deeper aquariums do give you more selection of taller plants that can be used such as Vallisneria that resist Goldfish chewing. As an example let’s take a 30 Imp (37 US) gallon glass aquarium, which in some publications would be the smallest aquarium you should consider. 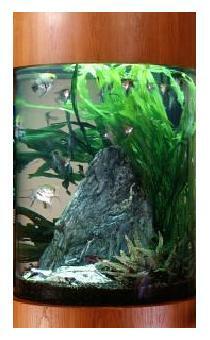 Typical measurements for an aquarium of this volume could be 48”Lx12”Wx15”H (1220x305x381mm). It would be made from 3/8” (10mm) thick glass and weigh about 48lbs (22 kilos) before any water, decorations or gravel are put in it. It will take two people to move it safely, and the logistics required to change water or do a complete strip down need to be thought through carefully otherwise a simple 50% water change will be a half day job. The larger and deeper your aquarium is, the harder it will be to maintain. For aquariums 30 gallons and above, it is impractical to strip down your aquarium for cleaning every few weeks. You want to be able to maintain your aquarium without having to remove it from its location. Siphon hose – A siphon hose is indispensable for maintaining a large aquarium. It should be long enough so it can be run through the house to the outside or to a waste water drain and left to run while you get on with other tasks. It can then be used to refill the aquarium by attaching a hose or using a tap fitting. A critical aspect of using a siphon hose is the aquarium must be at a reasonable height off the floor, the higher the better, but not so high as to make maintenance difficult. Tongs – long handled tongs are useful for any aquarium, but for tall aquariums or ones positioned at eye level, they are a necessity. Some have removable heads that can be swapped from grasping tongs to plant trimmers. Nets with long handles – Buy nets that suit your aquarium depth. The deeper the aquarium, the more open the netting weave should be, especially if you have a single tailed Goldfish variety. Filters – Filters are essential for any aquarium, but vital for larger aquariums. You still need to do regular water changes, but a filter will cut down maintenance time and frequency. The only problem is, the larger the aquarium, the larger the filter required. An Internal filter will take up a lot of room inside the aquarium and will need to be hidden from view. An external canister filter needs sufficient space to be located near the aquarium either alongside, behind or below the aquarium, and a hang on type filter needs to have sufficient space behind the aquarium to allow easy servicing and removal. 4. Gather tools and equipment suitable for your aquarium design that make maintenance quicker and easier. And yes, you should buy the largest aquarium you can afford or fit into the space available, just make sure the design is the most suitable for your purpose.